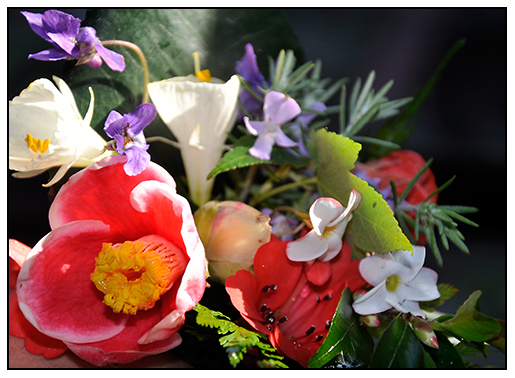 PERIOD FLOWERS, PICKED TODAY IN THE GREENHOUSE. Studies their nature, and supplies their wants. B'neath thy glass, first-born greet a dawning year. 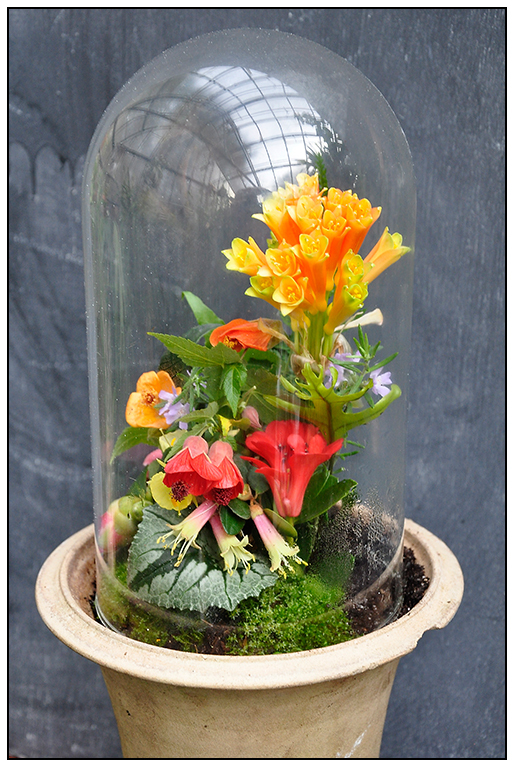 In 1850, winter flowers were often presented under glass domes, or placed in bowls and vases within Wardian Cases, where the extra humidity would keep them fresher. Greenhouses were heated by coal or wood, and night-time meant even colder temperatures. Homes where also wood or steam heated, heated, and most recommended that plants and flowers be brought into the center of the room for evenings, so that they would not freeze when the temperature drops on chilly nights. 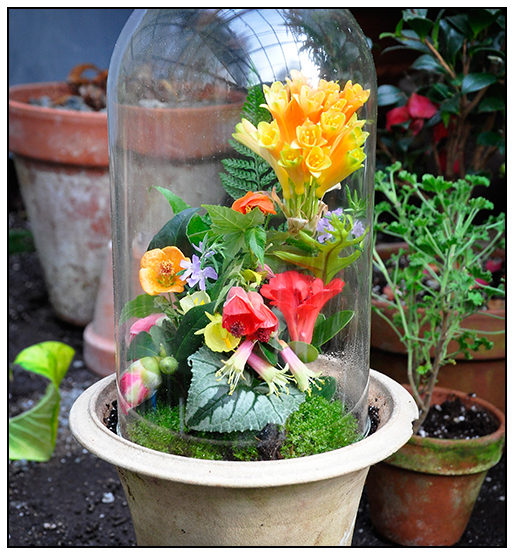 Above, a New Years' urn created in the 19th century style, it includes many flowers in bloom in the cold greenhouse today ( from top), Clivia caulescens x nobilis, a natural cross which occurs in South Africa, Westringia rosmarifolia, two Abutilon varieties (the flowering Parlor Maple), a red Vireya Rhododendron, pink and cream colored Correa 'Western Hills', a good shrub for winter gardens under glass, Narcissus romieuxii and Narcissus cantabricus, Camellia japonica and a Cyclamen graecum leaf. Moss and ferns complete the period composition. Alos, the term 'Florists', is an old term for those who grew not only grew plants and flowers to sell, but also those who bred flowers, sold bulbs and notions for growing plants. Somewhat different than what a florist is today. In 1853, a 'Florist' was more like a butcher who raised his own meat, and bred his own cattle as well. At the end of each year, I treat myself to a small selection of rare gardening books. Like many gardeners, I prefer to choose my own books, as many of you would understand, I am not the easiest person to buy a plant book for!. 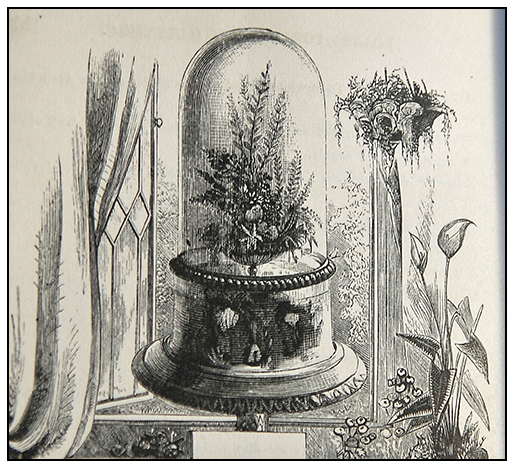 This year, I've found 5 very nice vintage gardening books, all printed between 1802 and 1908. , and most focus on the subject of growing potted plants indoors, either under glass in some of the country's first greenhouses, or in conservatories. I find the subject of 18th century greenhouses appealing for many obvious reasons, but mainly, as a New Englander with a glass house, living just outside of Boston ( where many of these books were published), I can relate to this desire people had for 'keeping a glass house' in the middle of winter where one can grow tender plants, trees and shrubs collected from around the world. I PICKED A VERY NINETEENTH CENTURY COMPOSITION IN THE GREENHOUSE TODAY. THESE ARE FLOWERS ONE WOULD HAVE FOUND SOLD ON A DECEMBER STREET CORNER IN LONDON OR IN NEW YORK DURING THE LATE 1800's - FRENCH SCENTED VIOLETS, CAMELLIAS, HOOP NARCISSUS, TROPICAL RED RHODODENDRONS ( VIYREYA) FREESIAS, ALMOND-SCENTED OSMANTHUS AND WESTRINGIA ROSEMARIFOLIA ( THE PALE LAVENDER FLOWERS). Greenhouses are magical in the winter. 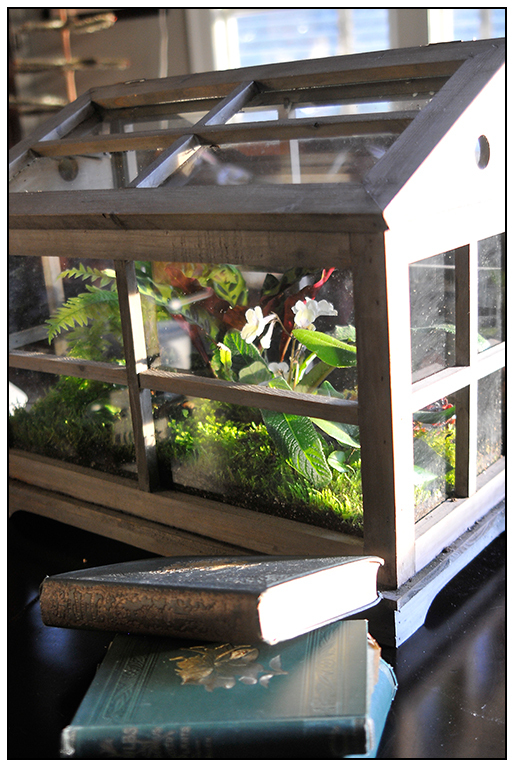 A thin sheet of glass divides two climates, outside, the bitter cold, dry winter and New England blizzards, inside - it's warm and moist, and the air is thick with the scent of winter-blooming trees and potted plants like jasmine, narcissus, freesia, scented camellias, fragrant Parma and French violets. At one time these were the only flowers available during the winter for many people who live where it snows, and before air travel made shipping flowers around the planet an every day event, a greenhouse was the only way to get fresh flowers, citrus and vegetables. Although it is busy around the house here during the Holidays, I thought that I would just drop a note to wish all of you a very Merry Christmas, Hanukkah or Happy Winter Solstice. As I continue to clean up, do dished, throw out wrapping paper a burn off some of the calories, here are a few images from our home from last nights dinner. Plus, a crazy indulgent wreath that I made with some white single camellias that were blooming in the greenhouse. 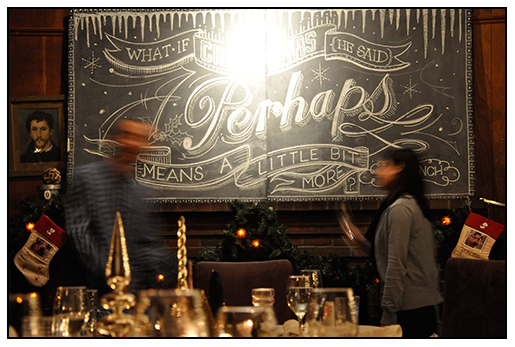 As you can see, I went a little crazy with the chalk, after becoming inspired by the talents of New York artist Dana Tanamachi, something I want to add to this blog starting this week - blackboard art - here is my test piece that I created for our family Lithuanian Christmas Eve dinner. I was fretting about what quote to use, first starting with 'Twas the Night Before Christmas', but it just felt wrong, so I erased it and wrote 'Tis the night before....", but it still felt wrong. I ended up with a nice quote from Dr. Suess' 'The Grinch', which seemed to set the perfect tone on this cold, winters night spent with friends and family. Wishing you all a very, Merry Christmas...and just think about it......the seed catalogs are arriving already! 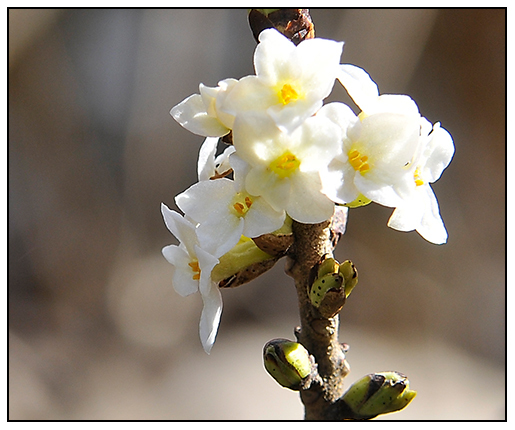 A mild December - What's in bloom, outdoors. Every Few Years, we experience a mild December, if not a mild winter here in New England, making some of us dream a little that perhaps, we are gardening in Britain, when such winters are the norm. Much of Europe and the UK have winters that hover around freezing, allowing Hellebores and Daphne to bloom in December and January. Dreams of such weather occuring in the Boston area are unrealistic, since December and January typically means deep snow and frigid temperatures near 0 deg. 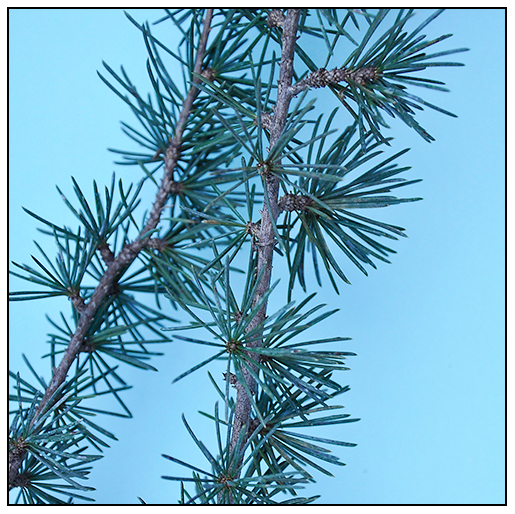 F.
ATLANTIC WHITE CEDAR, HAS BRIGHT BLUE NEEDLES, AND GREY BRANCHES - JUST A TWIG OR TWO IN A STONE CONTAINER BECOMES AN INSTANT HOLIDAY STATEMENT. CAMELLIA 'YULETIDE' - FRAGRANCE AND BEAUTY, FRESH FROM THE COLD GREENHOUSE THESE WILL BRIGHTEN DARK HALLWAYS AND GUEST ROOMS THIS COMING WEEKEND. 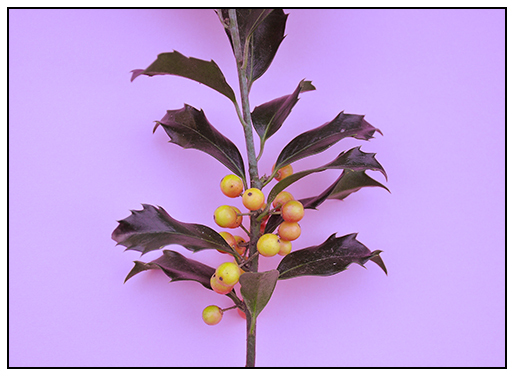 YELLOW-BERRIED HOLLY IS A SURPRISING COLOR-BREAK FROM THE TRADITIONAL RED-BERRIED FORMS. THE GOLDEN FRUITS MAKE THESE HOLLY WREATHS SOMEHOW MORE STYLISH. SINCE THE GREENHOUSE CAMELLIAS ARE EARLY I AM ABLE TO PICK MANY TO ADD TO INDOOR WREATHS AND FOR THE HOLIDAY TABLE THIS YEAR. Useful digital gifts which may surprise you (and them). 1. 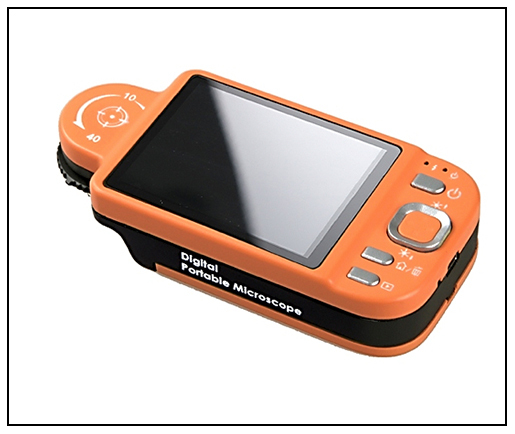 Oh Yes..... A Digital Microscope! ( and camera). Find ViTiny on Amazon, but it's price is a little higher than list. This may be the most interesting and useful gift for any serious plantsperson - essential for students or the genus kid who wants to win the next science fair, it very well could make the stocking of an adult gardeners who is curious about pollen, insects, floral parts, identification or for fun. Finally, in the global plethora of iPods and music players, comes something that a plant enthusiast could really use. Imagine botanizing for alpines in Chile, or the Alps, and pulling out your digital microscope to view some seed pods on a saxifrage? It magnify's 5x - 90x, so you're not exactly going to find some new particle that could be named after you, and will prove string theory, it still allows you to examine, explore and discover a whole new world of plants. At $199.00 it's not too expensive, and since it acts as a digital camera too, it blasts away any Sony Quickshot. Aston Kutcher may not be using this at his next coctail party, but I might be! This is simple elegance, I think I am in love with the Dodocase! As a designer myself, I kick myself for thinking of this first. I mean, I did invent this ( but never showed any one because I thought people would laugh!). Come on - don't tell me that you don't miss the smell and feel of a hard-cover book? OK, I may not be man enough to admit that I rarely purchased paperbacks, because I preferred cloth-bound books ( I even remove the paper slip covers ruining any value) ( but I'm old fashioned in that quirky way, where I insist on staying through the credits of a film, to compete the 'full experience' and to appreciate the score'). 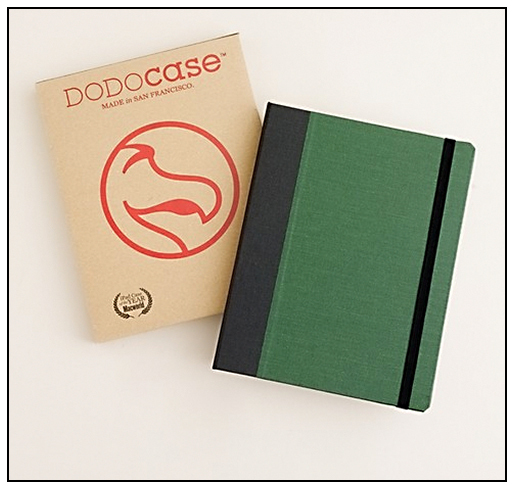 The Dodo Case - not only a gift for the Neo Luddite, anyone who appreciates a fine book and reading experience will love one. 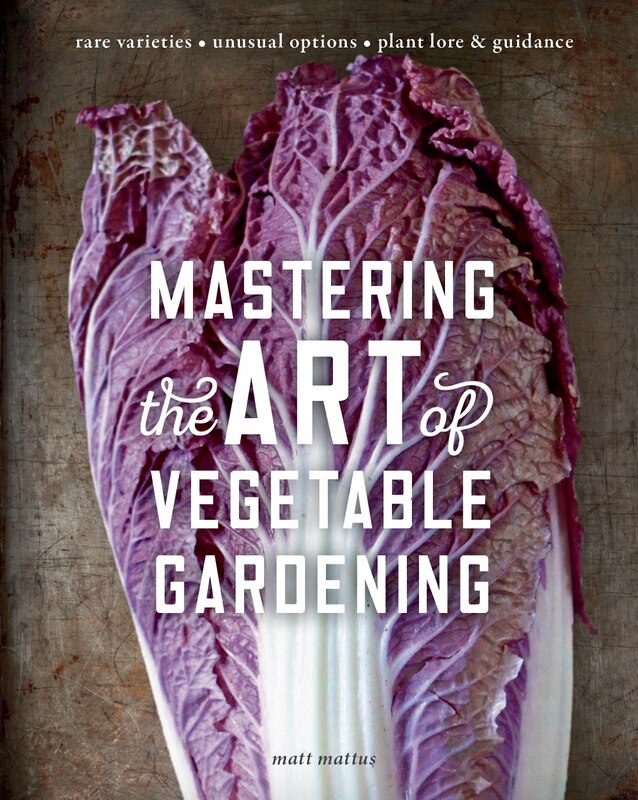 It's one of those Holiday gifts that I believe any gardener would appreciate. 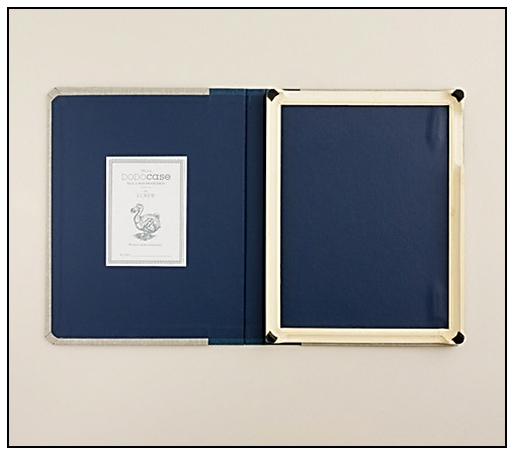 Available from the Dodocase website, or the Jcrew website ( in case you need to oder me one for delivery by Christmas). 3. 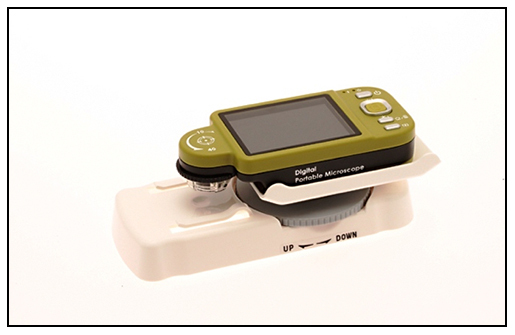 Digital Binoculars and Digital Camera, all in one. 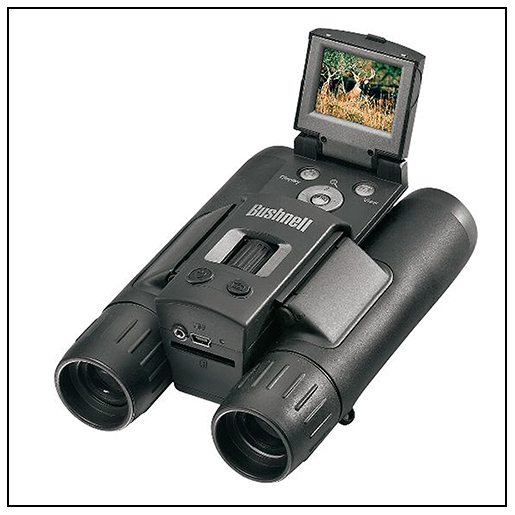 Thanks to Bushnell, the leader in binoculars, this device, also available for around $200.00, can be very useful for many gardeners, outdoors people and birders. Imagine trying to visually capture some images blossoms on the top of a rare magnolia in China, or a rare honey creeper in Hawaii, as it sips nectar at the top of a tree, or a hummingbird high on a Saguaro cactus in Arizona ( OK, or, to nail that 8 point buck before you blow him away). Trailrunner is a software program designed for trail runners and mountain bikers, but it also is priceless for hikers, and plant hunters, if you spend time in the back country or at high-elevations ( take note you NARGS members looking for a unique gift for your alpine plant enthusiast). 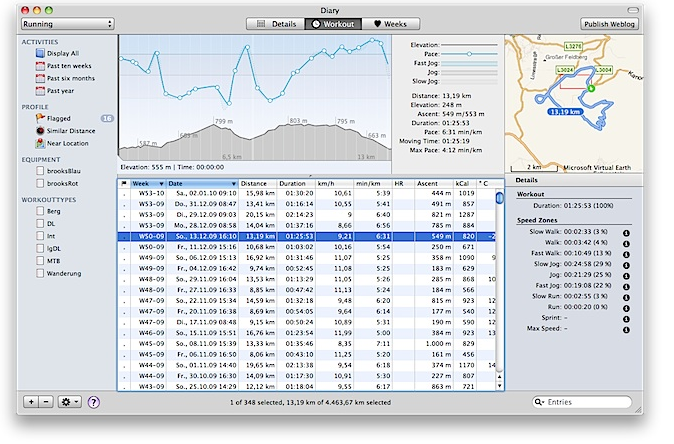 Trailrunner is a route planning software at it's core, but it can do more than record the calories and the distance traversed, it can calculate routes, alternate return trails, export information and directions onto your iPhone or GPS, and it provides detailed GPS information the entire time that you are on the trail. Need to note exactly where you saw that Eritrichium nanum ( and it will take 760 calories off of that lunchtime raclette that you chowed down back at the hutte). 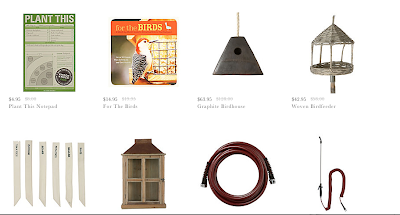 From a company that makes home weather stations ( I like those too, since an old-fashioned rain gauge and barometer stick, may seem quaint and old-school, when it comes to weather, I like to be serious about it). 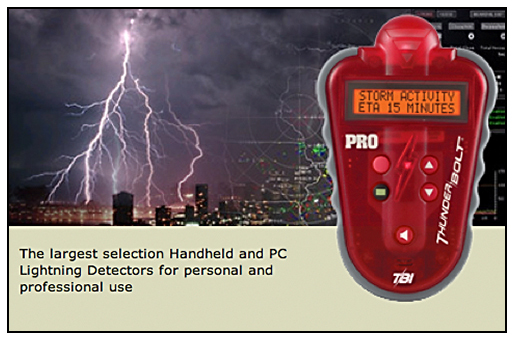 This is available from Ambient Weather.com, and it is a device which may seem senseless to some people, unless you spend as much time as I do out in the garden, or hiking above treeline in the mountains. It is also helpful if you spend too much time out in the garden putting up a scarecrow just as a thunderstorm is brewing up ( just sayin'). Listed in Martha Stewart Living! I can't believe that Growing With Plants made a best-of listing in the next issue of Martha Stewart Living Magazine. 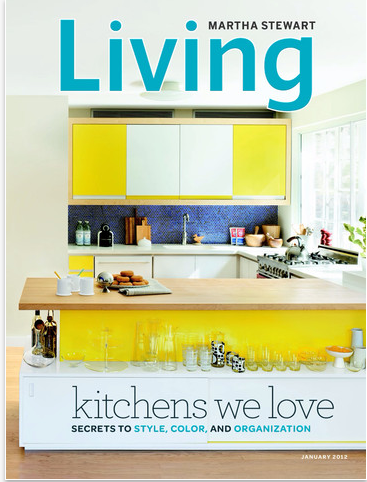 I am listed on page four of the January 2012 Martha Stewart Living Magazine as an 'On Our Radar', a sidebar for one of the four blogs worth bookmarking! Thanks so much for the support folks at MSLO! I am SO honored! A WALK AROUND THE GARDEN, CAN RESULT IN UNUSUAL MATERIALS FOR HOME-MADE WREATHS. 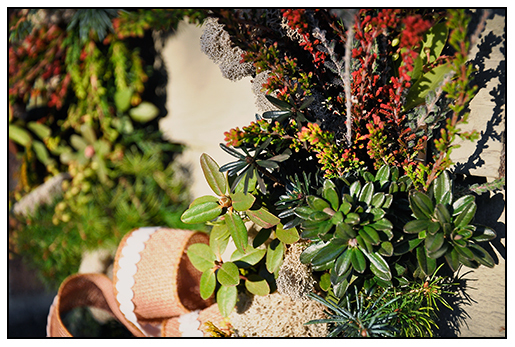 THIS ALPINE WREATH WAS CONSTRUCTED WITH CLIPPINGS FROM ALPINE DAPHNE SPECIES, ERICA, HEATH, DWARF RHODODENDRON, REINDEER MOSS AND MINIATURE SHRUB CLIPPINGS. 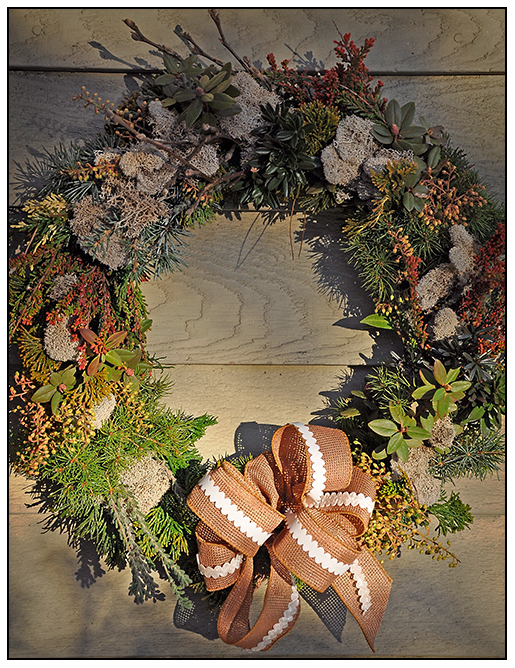 Commercial wreaths can be so boring. On the Saturday following Thanksgiving, my father would take us on hikes into the woods to collect Holiday greens. Armed with large, musty burlap chicken grain bags that said "Blue Seal Feeds" on them, each of us would search for Kalmia, white pine, ground pines and Gaultheria ( oh, so illegal now!). Once home with our spoils, we warmed up with hot chocolate and mom's date nut bread, as dad prepared the living room floor with drop clothes. 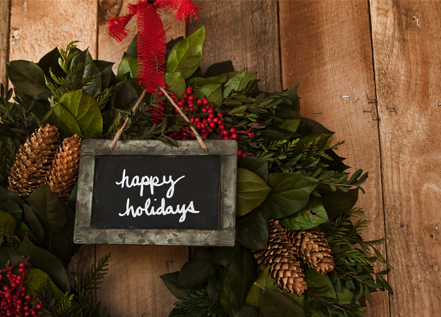 We would spend the night, making garlands, wreaths and berry bowls marking the official start of the Holiday season. 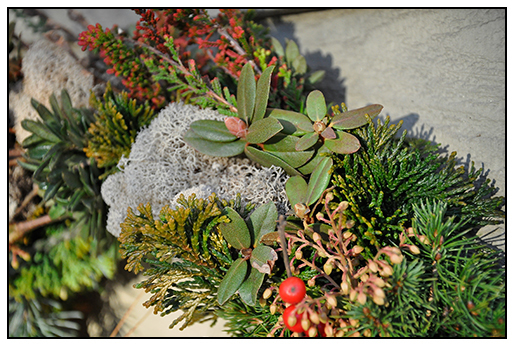 Clippings in the Alpine Wreath include miniature berried shrubs, dwarf alpine willow, and various lichens and mosses. 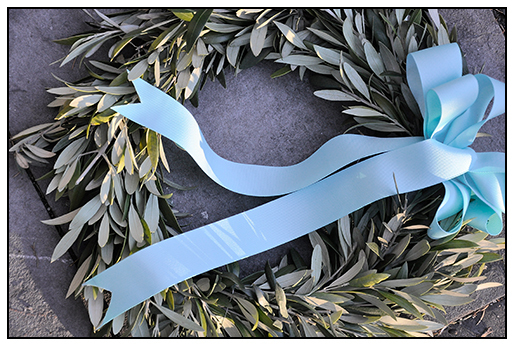 Today, even if it was legal to collect native greens from endangered plants, I still like to live on the edge and 'steal' little pieces of some very precious shrubs and trees to make wreaths that are themed, and very special. This week, I am going to share some of my annual favorites including my Fletcher Steele inspired 'Golden Green' wreath, created from only golden needled shrubs, a homage to the late landscape architects gold border at the Stoddard Estate where I had my first job as a gardener during my high school years. I have also designed a beautiful yellow berried holly wreath with a rare golden-berried holly. Later in the week I may share those, but first, I share these two: An alpine wreath, with plant material collected from my alpine garden, made from rare Daphne species, arctic willows and other small shrubs, and a precious fresh olive wreath, made from fresh cut olive branches from one of the large Italian olive trees in the greenhouse. 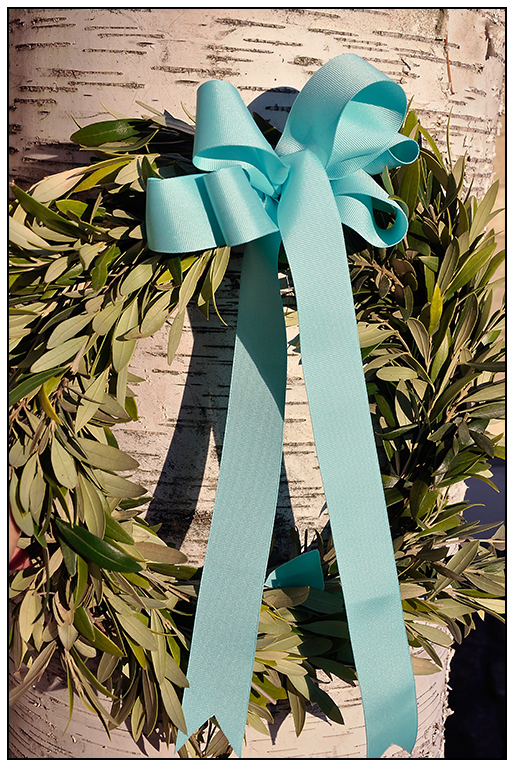 Fresh olive greens make a Mediterranean statement, and a unique wreath for a New England home, since olive trees cannot be grown outdoors in zone 5. My annual December pruning session so that the larger plants in tubs will fit in the greenhouse provides enough olive, rosemary and bay laurel to make a few of these sweet wreaths for our home, or for special gifts. 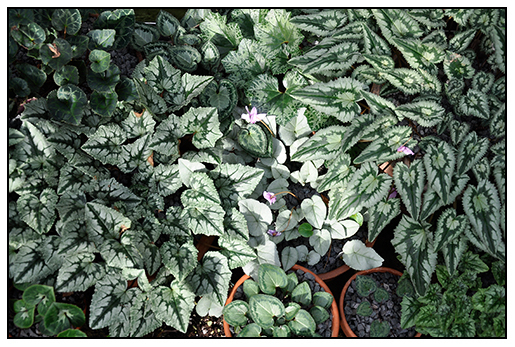 Here are twelve different leaf forms found in wild cyclamen species, While watering the greenhouse today, I was struck by the diversity and beauty that the entire collects presents as a display. Since I never take these plants into the house, no one sees them, so I will share a dozen forms here. All are from my collection growing in a sand plunge bed in the greenhouse. I find that winter cyclamen foliage display is something that I look forward to every year, even the seedlings are fun to evaluate every winter, selecting ones with more patterned leaves, especially with the Cyclamen hederifolium seedlings, variety can mean getting some leaves long a slender, like arrowheads,while others form a strong, Christmas tree pattern. A few emerge with the choicest of all leave patterns - none, rather they are completely silver, like pewter or silver - cyclamen species are perhaps the most Christmassy of plants. Cardoons - So Yummy, It's Cardunculous. 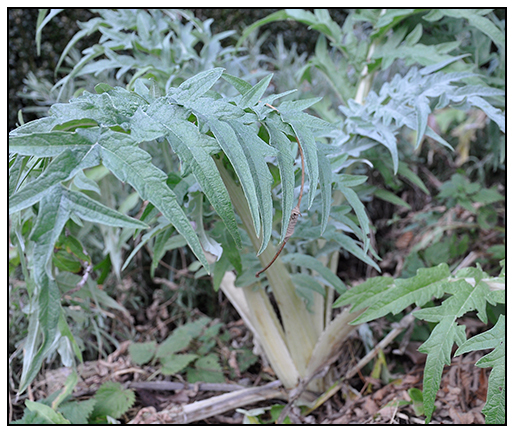 CYNARA CARDUNCULUS, or the COMMON CARDOON - IT LOOKS LIKE FUZZY CELERY WITH THORNS, OR AN ARTICHOKE PLANT ( WHICH IT BOTANICALLY IS), HAS RECENTLY BECOME A STYLISH ORNAMENTAL FOR THE SUMMER GARDEN, WITH ITS LARGE, THISTLE-LIKE FOLIAGE, AND GREYISH COLOR. Worth growing for many reasons, the Cardoon is gaining in popularity as an ornamental, often seen in trendy perennial borders, where young plants set out in spring, grow into massive, grey-foliaged urn-shaped forms which compliment many planting schemes. 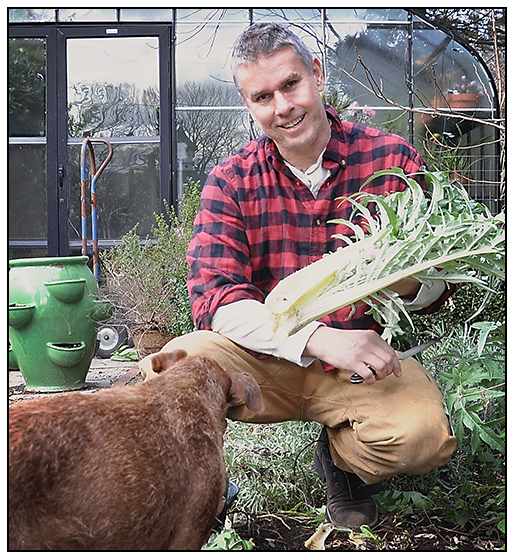 What many new gardeners do know, is that history of this plant, a popular medievil and ancient European vegetable, even grown in colonial America as a late autumn and early winter vegetable. Today, the crop is still cultivated in France, particularly the Savoie and Provence, where the trimmed thick, white stems are braised, and slow-cooked with various alpine cheeses, cream and Parmesian - how could anything combined with that, be bad? 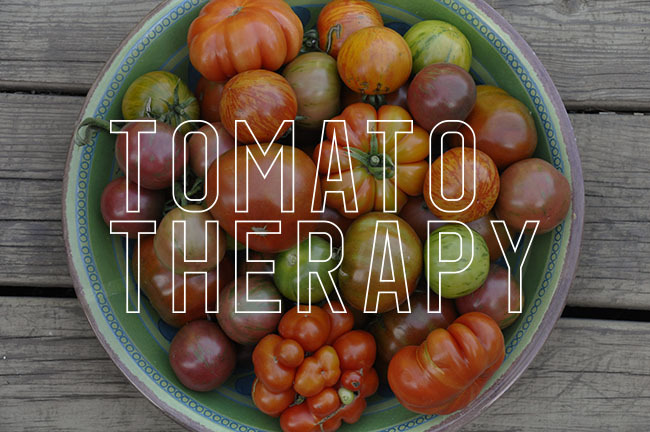 I think it's time that we re-discover the other benefits of this ancient vegetable, consumed since the 4th Century, that makes even the oldest heirloom tomato, seem infantile. CARDOONS, ARE KNOWN IN ITALY AS CARDONE, CARDUNI, OR CARDI, THIS THISTLE-LIKE RELATIVE OF THE ARTICHOKE IS A POPULAR VEGETABLE IN MANY MEDITERRANEAN HOLIDAY RECIPIES, ESPECIALLY IN GREECE, PORTUGAL, MOROCCO, LYBIA CROATIA, FRANCE AND ITALY, WHERE IT IS FOUND IN MANY CHRISTMAS EVE DISHES. One can't write about cardoons, without mentioning artichokes, for the two share a small genus ( Cynara) and they are so close, in fact, that only the species name changes, and many selections are difficult to define when seen growing side-by-side in the garden. 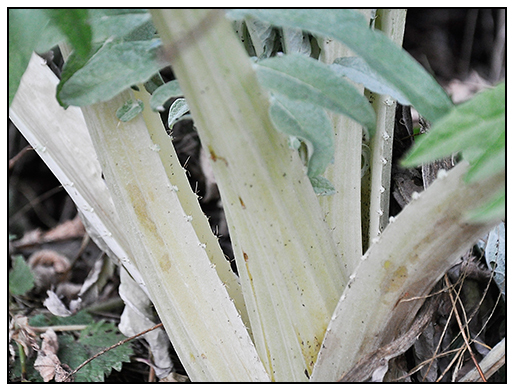 Some selections of wild cardoons in Sicily even have edible buds, like artichokes. Cardoons are easy to grow in many temperate gardens ( Zones 3-6 as annuals, and they may winter over in warmer zones), the plant is best cultivated as an annual. Seeds must be started indoors, early in the year, for they require a long growing season. I order my seed in January, and start them along with artichokes, in early February in the greenhouse. Young plants grow best with bright light, so keep seedlings under lights if you do not have a greenhouse, with the lights set at 16 hours of day-length. 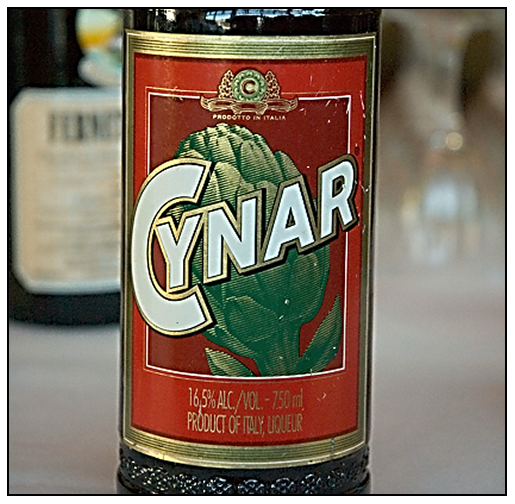 Cynar, an Italian aperitif, is a liqueur which takes advantage of the bitterness found in cardoons and artichokes. Hip New York restaurants, like Mario Batali's BABBO, serves wonderful cocktails with this liqueur, some with blood orange juice, gin and it is included in authentic negroni's instead of Campari. BLANCHED CARDOONS ARE HARVESTED IN NOVEMBER, CUT AT THE BASE, WITH THE CUT END WIPED IN LEMON JUICE TO PREVENT BROWNING. WATCH OUT FOR THE TINY SPINES! 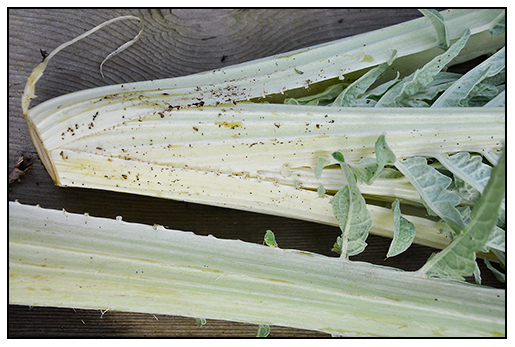 Cardoon stems must be blanched before eating because they can be very bitter. In gardening terms, this means wrapping them stems in a light-block material for approximately four weeks starting in late September, which will turn the stems white if you are successful in blocking out all light. Old gardening books, such as the Vilmorin vegetable guide advises that the stalks be wrapped in hay tightly, and then have the soil earthed-up around the bundles. Newer methods use any opaque material along with cord, to tie the plants into grocery-store celery-like bundles. 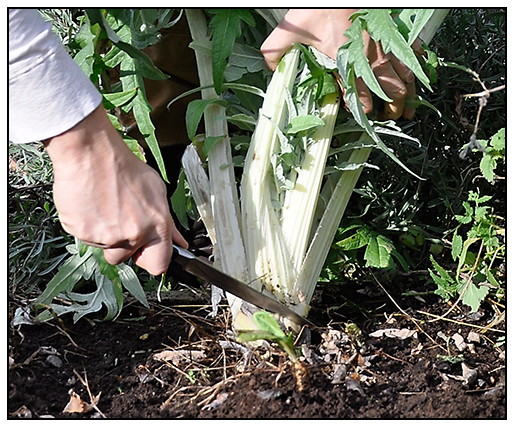 There are self-blanching varieties, or if you really want to be authentic, you can wrap the mature plants in October with tar paper or black sheeting, tied tightly around the stems, so that they grow white ( a method used in Europe), or use specially designed cardoon blanchers, terra cotta tubes that fit around the stems. 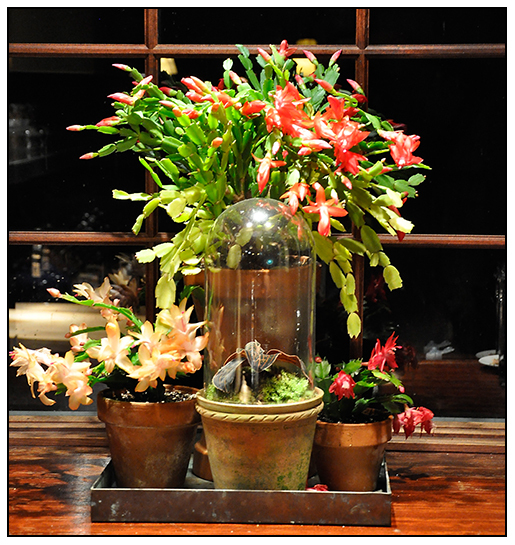 ZYGOCACTUS, SCHLUMBERGERA, OR CHRISTMAS CACTUS, PERHAPS THE ONE PLANT MR. BALDWIN CAN'T TWEET ABOUT BECAUSE OF CHARACTER COUNT. Early December is busy for everyone, and even though we have not started to decorate ( or clean!) the house this season, thanks to Mother Nature, our plant collections continue to bloom on schedule, without hesitation, much like an Advent Calendar, there are plants that bloom on certain days and times, and we just can't stop them. ( OK, it's a stretch, but I'm not feeling that well today). Here are a few blooming right now. 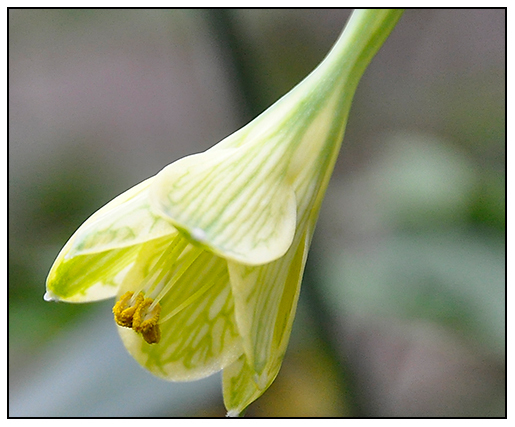 Native to South America ( Equador and Peru), this rare bulb looks like a smaller, green flowered Amaryllis, but it's not. 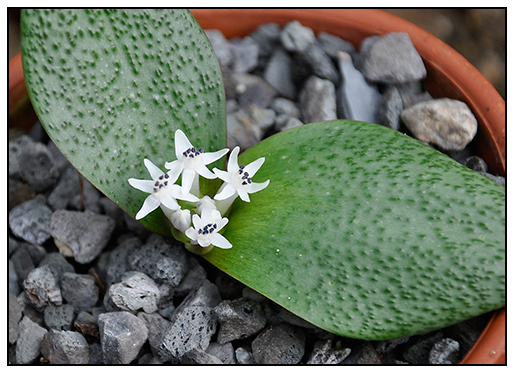 Stenomesson piercii is a, choice bulb only found in the most geeky of plant collections, ( I gave a few bulbs away a few months ago, when I repotted mine). 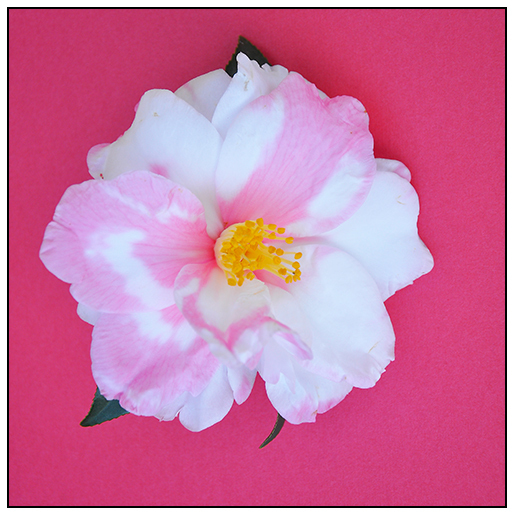 Blooming a month early this year, I was surprised to find this one stem hidden in a camellia bush in the greenhouse. From the deserts of the cape floral zone in South Africa, comes this Massonia jasminiflora. 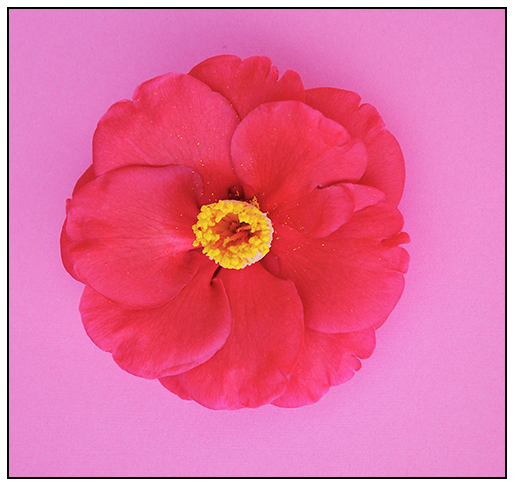 It only produces two leaves, and a little cluster of blossoms in the center. Some species have beautiful foliage that can have very smooth leaf surfaces, and others have these strange little pustules, or blisters. This Christmas time bloomer has a little of both, and the flowers smell like, well, not Jasmine....more like hay. It may be night scented, I will have to take a whiff later in the week. CLEMATIS CIRROSA var. 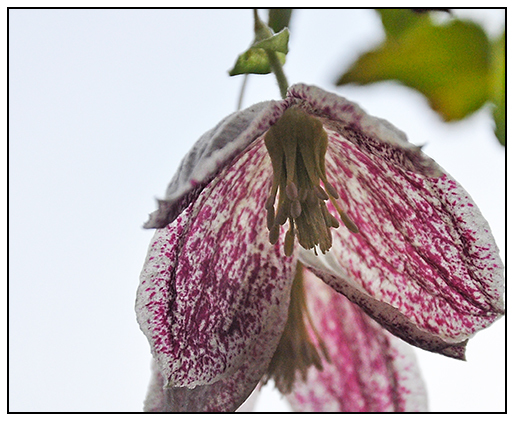 BALEARICA 'FRECKLES', A WINTER BLOOMING EVERGREEN CLEMATIS FOR COLD GREENHOUSES, OR WINTER-MILD GARDENS IN CALIFORNIA. Clematis for Christmas? 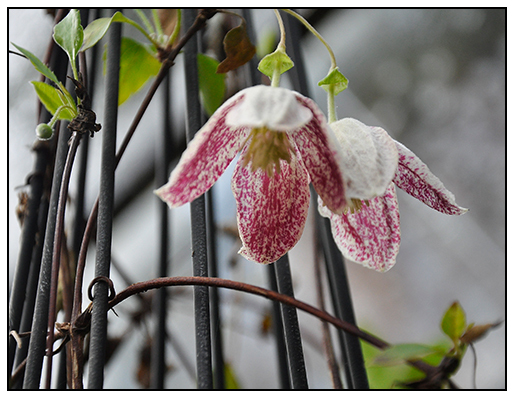 If you are surprised, you are not alone, but if you are looking for a beautiful winter blooming vine for your winter-mild garden ( zones 9 plus) or for a cool greenhouse in the north, consider the evergreen Clematis cirrhosa var. balearica. 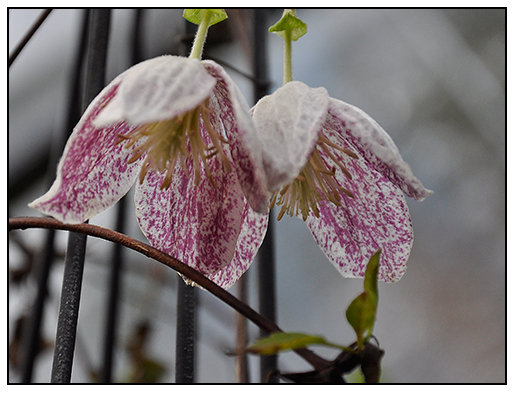 We have all have a vision of clematis vines, but winter-blooming clematis? Not so much. If your idea of clematis brings to mind a motif which involves tacky lamp posts in the summer, there are some very choice species and selections that are more interesting, particularly a species that comes from the mild winter climate of Spain and Italy. Gardeners who live in warmer areas like California are more likely to be familiar with these winter-blooming clematis, as Clematis cirrhosa var. balearica, is a common vine in the western US. Interested if growing one? You can find one at Plant Delights nursery). Winter blooming clematis make great container plants in the north, if you can provide a cold, moist conservatory which is sunny. A few are even showing up as florist plants at the Holiday, so keep your eyes open. I have seen them at Whole Foods and at Trader Joes a few years ago. 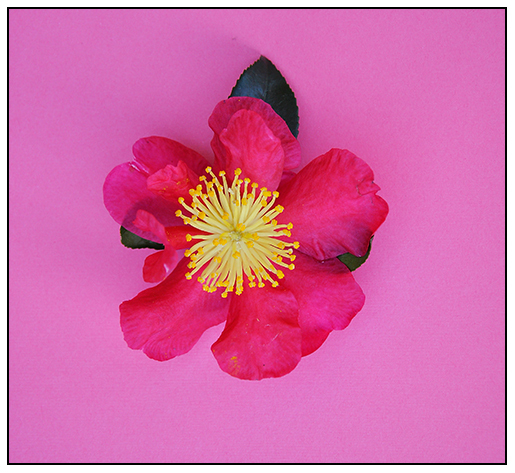 These selections all have nodding, four-petaled blossoms, and many have speckles. Clematis cirrhosa grows wild in places like Corsica, Majorca, and Sardinia, which should provide you with some information on the winter conditions required. 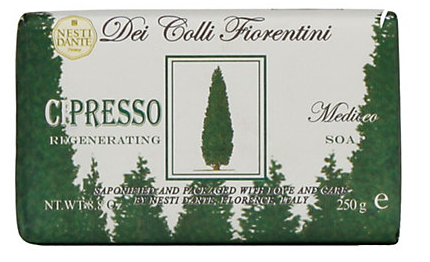 I would say that if you can grow a rosemary outside, or in a plant room that remains cool, then you can try one of these. Selections of C. cirrhosa are always hard to find in the states, look for then names which often have Christmas titles - C. cirrhosa 'Jingle Bells ( an all white form) comes to mind. My first C. cirrhosa Jingle Bells' came as a Holiday gift plant. Other selections to look for are 'Wisley Cream', ( a white and greenish blossom, and 'Freckles', shown here. A few commercial growers are selling a few of these Clematis to retailers like Whole Foods and flower markets, trained as wreathes as a seasonal pot plant in the north, but if you have a cold greenhouse, the species makes a magnificent show ( this is my first year growing it, but I have seen some vines in greenhouses that are often in full bloom at Christmas). Commonly grown in gardens in the United Kingdom, in North America, the species and named varieties are harder to find. SPECIAL ONE DAY SALE at Terrain 40% Off Sale for Readers! If you live in the Philly area, the sale starts for IN-STORE guests on Thursday, Dec 1 and ends on Tuesday, Dec. 6th. So get your vintage woody truck, some Filson wooly underwear, and your 8 heirloom reindeer ready. 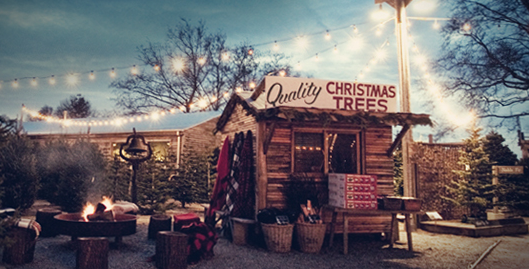 It's time for some serious Xmas style upgrades to your garden. Not on sale, but so nice. 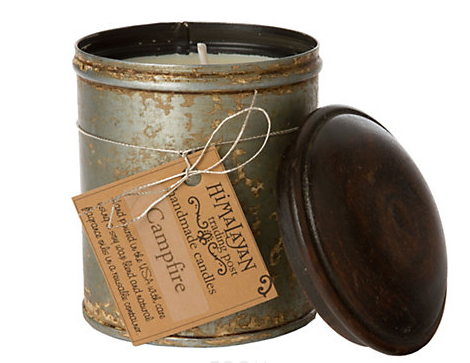 My favorite soap - Smell like a lumber Jack.